He’s guilty of murder. The feds have him dead to rights. At last there’s no escape for this mob boss, a “Teflon Don,” who has slipped free of murder raps so many times before. He can’t fix the case so he fixes the jury. He threatens a single mother and her young son. She goes against the jury and votes to acquit. But her nightmare is just beginning. The DA suspects her. The Don wants her out of the way. She has to fight the world just to survive. In Trial by Jury, Joanne Whalley Kilmer (Scarlett) plays Valerie Alston, a dutiful juror thrust into a nightmare… and forced by her plight to discover hidden resources she never suspected she had. 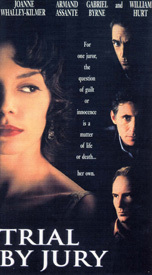 Armand Assante (Gotti, The Mambo Kings) is the gangster who vows death to Valerie and her son if she votes “guilty.” William Hurt (Body Heat, Broadcast News) as a cop turned mob lowlife and Gabriel Byrne (The Usual Suspects) as a zealous prosecutor add to the excitement of this fast-paced action thriller.